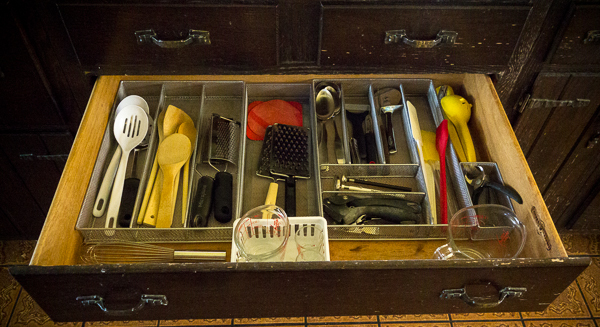 When we moved to our house over 7 years ago, I made a good stab at organizing the kitchen tools into one long drawer. I always meant to make another pass at it after I learned how we used the kitchen. Seven years later, with never another attempt, this drawer is a jumble. 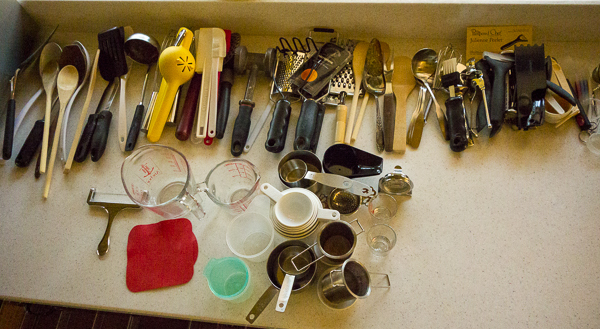 “Clean the kitchen tools drawer” has been on my spring cleaning list for weeks, but I finally got it done when I realized I could write a Weekend Cooking post about it. I hoped that it was just an organization problem. I laid everything out on the counter organized by size and figured it would all come together like a jigsaw puzzle. As usual with these sorts of things, however, the problem wasn’t organization — it was too many things in too small of a space. I threw out a number of duplicates and unused tools and moved a few things to a less-accessible drawer across the kitchen. That helped. But there were still things on the counter. I decided a nearby drawer was being under-utilized. It’s the drawer that is supposed to hold our folded napkins. All well and good if, in fact, we folded napkins. Instead, we fetch them from the laundry basket. 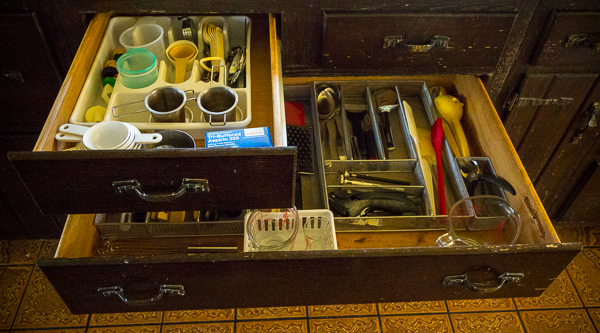 That drawer is prime space — no use reserving it for a fantasy. How do you store your kitchen tools? Good work! I keep all baking stuff in one drawer. That helps because measuring cups are always getting stuck. I use a basket for my napkins that sits on the bottom of my plant stand because no plants can grow that low to the ground! There is a satisfaction of opening a drawer and seeing a well organized presence. I purged a bunch of the kitchen gadgets and tools when we moved, but things are starting to get out of control again. Inspired. But oops! I’m in San Francisco these next two days. Guess it’ll have to wait! Still, inspired. thanks! Good job! I’ve been moving things around in the cupboards this week. Also need to get rid of the duplicates in my drawers. Good for you! My kitchen drawers are a wreck b/c we moved a year ago and I had a 1 month old baby at the time…I think my brain wasn’t functioning when we unpacked and I still haven’t done anything about it! In order to accomplish our downsizing empty nester move from our house to an apartment in 2010, I pretty ruthlessly went through our kitchen drawers. Why move 4 can openers? I do allow my most used cooking utensils to reside in an open ceramic pot next to the stove. Since the move, things have stayed relatively organized. As you learned, the key is to have enough drawer space for your stuff. Otherwise, it’s a battle you’re not destined to win. 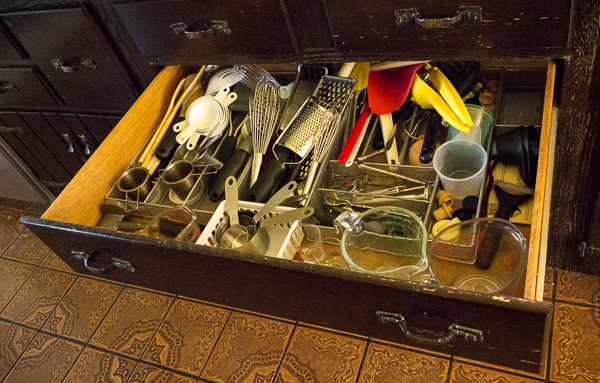 We organized drawers when we cleared out to make room for gluten-free utensils, bowls, rolling pin, etc. but they get messy so fast! We keep our most often used spatulas, serving spoons, ladles, etc. standing up in ceramic containers on the counter (unfortunately, three, because they don’t all fit into one or even two). Most get used often enough that they don’t get dusty, but occasionally we have to run the whole lot through the dishwasher. A job well done! Now that we live in an apartment, I have to be very careful about what tools I am willing to keep. They must be necessary and if they do double duty, all the better.